If grand hotels, restaurants, bars, discos, souvenir shops, traffic and sunseekers have colonised the coastline of Crete from Chania to landsend, in the hills, the villages remain untouched by any of the trappings of modern tourism and life is simple and peaceful. The perfect way to explore the Cretan hinterland is on the little train. It chugs and grinds slowly but steadily up the steep, winding, narrow and dusty roads through the olive groves, past humble stone farm houses, beehives, tiny family churches and graveyards. If you’re coming here yourself, you may want to consider a vehicle rental so you have the ability to explore the island at your leisure. For a wide range of vehicle and flexible car pick up locations, visit e-mietwagenkreta.de. The little train seems ungoverned by any timetable, or by any schedule of stops. It pulls up at house by the roadside and a small boy brings quartered oranges for the passengers to try. 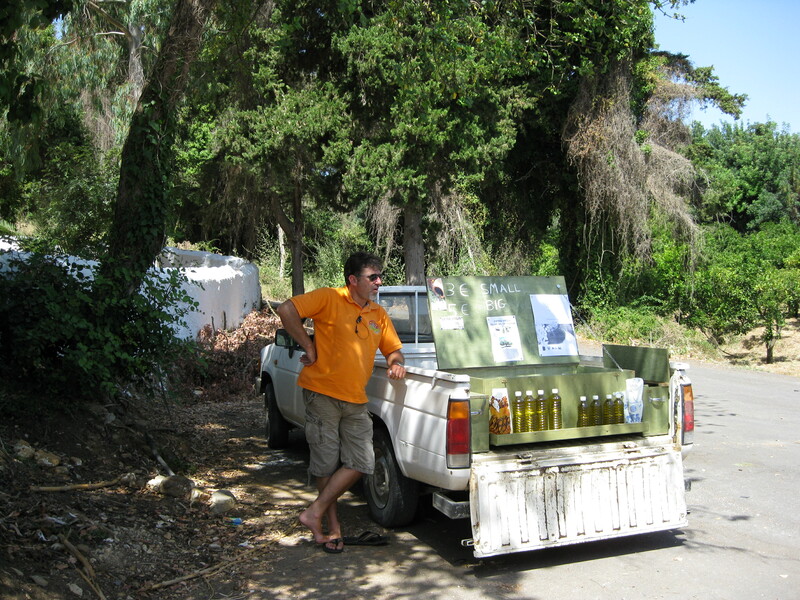 It pulls in again at a track where a farmer sells olive oil from a truck. It stops at a village high in the hills and we buy fresh orange juice at the Kafeneon. On a back wall hangs a photo of a soldier. One the many young men, the sons, the brothers, husbands and fathers who went away to fight on the mainland leaving old men, women and children to defend Crete against the German invasion in 1941. Every house on the island has a photo like this and a story to go with it. We wind back down another hillside on another road fringed by olives and oranges. It was down these roads that villagers, old men, women and even children marched, armed with ancient weapons, sticks, bats and even kitchen knives to defend their homeland. It was up these roads, a few short weeks later, that the Allied forces fled in retreat. It was up these roads that the Nazis raced in pursuit. There is no trace now of the ravages and the debris that disfigured this landscape in the aftermath of the World War II. Orange groves and olives roll down the valleys and wrap around the villages. The countryside is beautiful, harmonious, perfect. But still, the Battle of Crete and remains clear in the collective memory of this country. It will never be forgotten.